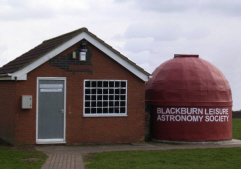 There were 7 telescopes set up outside with white light solar filters fitted 1 solar scope and 1 used as a projection. Inside the dome the main telescope was used, the drive for 2 smaller scopes mounted on the large one each with white light filters each with a camera attached, one camera taking a shot every 2.5 minutes and the other connected to a laptop computer and projected on to the wall giving a sun some 5 feet across where Mercury could be clearly seem, this was also recorded every few minutes which means that we will be able to make a movie of the transition which started at 12:15 until 17:30.
through the course of the afternoon we had about 50 visitors - one from Selby who had just caught it on the website and hastened down and enjoyed what was observed. Any views and comments are welcome on the forum posts.